180 Degree Turn Time11.25 sec. Initial HE Shell Velocity1000 m./s. Initial AP Shell Velocity1000 m./s. 610 mm Sextuple1 х 6 pcs. 25 mm/60 Type96 mod. 118 х 1 pcs. Kitakaze — Japanese Tier IX destroyer. A V7 project destroyer. This ship was a further development of the Akizuki-class destroyers. Compared to her prototype, she had a higher speed and carried more powerful torpedo armament. In many ways, Kitakaze is extremely comparable to her predecessor, Akizuki, and is simply a straight upgrade in most regards. She improves on Akizuki's speed, maneuverability, torpedo launchers, concealment, and has access to the tier nine module slot. Players who enjoyed Akizuki should feel right at home in the tier nine version. Kitakaze has four 100mm gun mounts, each with two barrels for a total of eight 100mm armaments. These guns provide most of Kitakaze's offensive firepower, especially when pared with her blistering three second base reload. This reload can be further lowered by selecting the Basic Firing Training skill in conjunction with the tier nine Main Battery Modification 3 ( ) module. Normally, a 100mm gun would not be capable of penetrating anything more than 17mm of armor—limiting the effectiveness of any such guns without the Inertia Fuse for HE Shells skill. However, all Japanese 100mm guns have an increased penetration for their base HE shells, allowing them to penetrate up to 25mm of armor even without the captain skill—And with IFHE, these shells can penetrate 32mm armor plating. In addition to her impressive main battery firepower, Kitakaze has a sextuple torpedo launcher. Along with her Torpedo Reload Booster ( ), this allows her to put twelve torpedoes in the water during a short period of time. However, keep in mind that this launcher also has a very long reload speed, taking more than two and a half minutes to be ready. Kitakaze's torpedoes are a useful tool to have in combination with her main battery firepower, and proves to be a direct upgrade from the torpedoes found on Akizuki. In addition, Kitakaze gains an extra three knots of speed in comparison with Akizuki, a second off her rudder shift time, greater concealment, and slightly better short range AA. Fans of Akizuki should greatly enjoy Kitakaze, as she essentially shores up some of Akizuki's key weaknesses like speed while also improving as a whole. She is a strong ship for anyone who appreciates the playstyle of a gun focused destroyer. Great firepower with her main battery guns. Able to fire twelve torpedoes using the Torpedo Reload Booster ( ). Decent amount of health for a destroyer at tier nine. Provides a large target for enemy ships to shoot at. Torpedoes take a monstrously long time to reload. Large and clumsy turning circle for a destroyer. Doesn't have Defensive AA Fire ( ) to boost her AA firepower. Captains should prioritise unlocking either the upgraded Hull or Gun Fire Control System first, depending on their own playstyle. Unlocking the B Hull give Kitakaze more health and a better rudder shift time, but the Fire Control System improves her gun range. Leave the torpedoes for last, as they are more of a secondary focus for Kitakaze. It should be noted that generally, it is acknowledged that the 12km version torpedoes are the most effective. Slot 1: Magazine Modification 1 ( ) to help prevent the ship from blowing up too early. Slot 2: Propulsion Modification 1 ( ) to lessen the changes of the engine blowing up and to get it running again faster. Slot 3: Aiming Systems Modification 1 ( ) or AA Guns Modification 1 ( ), depending on how important captains think having better AA is. Slot 4: Propulsion Modification 2 ( ) so you get moving faster. Slot 5: Concealment System Modification 1 ( ) to better sneak with. Slot 6: Main Battery Modification 3 ( ), because watching the world burn is wonderful. Generally, using the premium versions of Damage Control Party ( ), Smoke Generator ( ), and Torpedo Reload Booster ( ) greatly enhances Kitakaze's combat performance, and using them can be well worth the extra silver it costs. 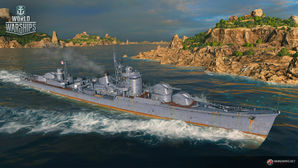 Players who wish to spend doubloons can equip Kitakaze with Type 19 camouflage that lowers her detection radius, reduces the accuracy of incoming shells, reduces her repair costs, and increases the amount of experience she earns. The Super Akizuki-class destroyer (超秋月型駆逐艦 or 改秋月型駆逐艦, Chō Akizuki-class or Kai Akizuki-class) were a projected class of destroyer of the Imperial Japanese Navy (IJN), developed during the Second World War. The intention was to develop a faster destroyer based on the Akizuki class. The IJN Technical Department (艦政本部, Kansei-hombu) gave them the project number V7. However, the project was cancelled with none of the proposed ships being completed, because of the continued Japanese defeats. This page was last modified on 19 February 2019, at 10:04. This page has been accessed 23,824 times.